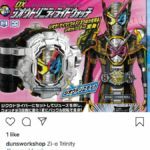 Kamen Rider Zi-O Trinity RideWatch & RKF Figure Revealed! A handful of new Kamen Rider merchandise images have been posted online, giving fans a close look at the new powers of Kamen Rider Zi-O! By uniting with fellow Time Riders Kamen Rider Geiz & Kamen Rider Woz Zi-O obtains his newest form, Kamen Rider Zi-O Trinity! This distinctive configuration has untold new powers. Like all Zi-O Riders, Trinity has a unique RideWatch that activates his transformation. In addition, Zi-O Trinity will be receiving an action figure in the RKF sub-series! Sadly, the true origins of this new form remain unknown at time of writing. Stay tuned to TokuNation for all Kamen Rider reveals! 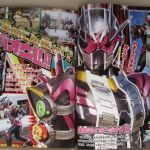 New Kamen Rider Zi-O Magazine Scans Online- Introducing Kamen Rider Geiz Revive! A pair of new magazine scans for Kamen Rider Zi-O have just been released! At last, Kamen Rider Geiz is receiving an upgraded form- officially known as Kamen Rider Geiz Revive! This form is activated by a new hourglass-based RideWatch and has multiple configurations- which can be changed by rotating the RideWatch. The Orange form utilizes defensive abilities, while the Blue form allows for powerful attacks. In addition, the scans confirm the return of fan-favorite Masahiro Inoue to the series! The Destroyer Of Worlds has taken on a new role- this time as a police officer. But just what is Kamen Rider Decade up to now?! Only time will tell! The DX Mirari Driver Set retails for 9720 yen, pre-orders begin today and run through April 8th , and the set releases in July 2019. Be sure to get in touch with your proffered middleman service or site to secure a pre-order for the set during the order window. Kamen Rider Zi-O Trinity Revealed! A brand-new upgrade has been revealed for Kamen Rider Zi-O! By using a unique new RideWatch, the 3 Time Riders- Kamen Rider Zi-O, Kamen Rider Geiz & Kamen Rider Woz channel their power into a single form: Kamen Rider Zi-O Trinity! The full powers of Trinity and the circumstances behind this strange new form have not yet been revealed at time of writing. Stay tuned to TokuNation for all Kamen Rider reveals! Introducing- Kamen Rider Woz Ginga! Not to be outdone, the unique Kamen Rider of the future Kamen Rider Woz will also be receiving an upgrade! 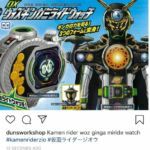 Thanks to the powers of the Ginga MiRide Watch– obtained from yet another time-traveling Rider, Kamen Rider Ginga, the prophet Woz will obtain powers beyond anything seen before. The full story behind this new power remains unknown at time of writing, but stay tuned to TokuNation for further details on the adventures of Kamen Rider Zi-O! 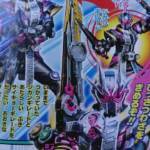 FIRST LOOK: Kamen Rider Grand Zi-O! 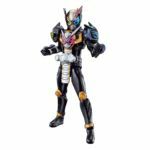 Following the earlier toy listings for the latest wave of Kamen Rider merchandise, we now have the first image of Kamen Rider Zi-O in his final form! This is Kamen Rider Grand Zi-O! The King of Time gains new golden armor, decorated with trophies representing the various Heisei Riders that came before him . The power of Grand Zi-O comes from the Grand RideWatch, whose origins remain untold at time of writing. UPDATE: An image of the DX Grand RideWatch has now been released! 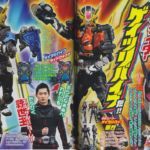 New Kamen Rider Zi-O Magazine Scans Released- Introducing Zi-O II And Kamen Rider Kikai! 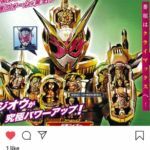 The latest round of magazine scans to hit the Internet has also given us a few hits at the future adventures of Kamen Rider Zi-O! While traveling through the Mirror Universe of Kamen Rider Ryuki, our hero Sougo is startled to find a second Kamen Rider Zi-O. This plus the sudden appearance of Another Ryuga may be too much for the King of Time to handle! To emerge victorious, Zi-O activates a new model of RiderWatch to become Zi-O II! This form is far stronger than any previous Rider Time combinations. But once that power is unlocked, another time-shifted Kamen Rider enters the fray! This is our first look at Kamen Rider Kikai– a golden cyborg hailing from the year 2121. Kikai’s powers will soon be tapped by Kamen Rider Woz adding yet another Futuring ability to his arsenal. Definitely some interesting times on the horizon for Kamen Rider Zi-O! Stay tuned to TokuNation for all Kamen Rider reveals! Kamen Rider Zi-O II Fully Revealed! The time has come for a new upgrade to Kamen Rider Zi-O! This is our first full look at Kamen Rider Zi-O’s enhanced form, officially known as Kamen Rider Zi-O II! Thanks to the powers of a mysterious new gold & silver RideWatch the King Of Time’s power grows exponentially. With the new form comes a brand-new weapon- the Saikyo Gilade! Zi-O II can combine this Saikyo with his previous Zikan Gilade to form the Saikyo Zikan Gilade! And it seems a fearsome new opponent will be the genesis for this upgrade: Zi-O II is seen facing off against Another Ryuga, a dangerous new Another Rider from the Mirror World of Kamen Rider Ryuki! Definitely some exiting times ahead for Kamen Rider Zi-O fans! Stay tuned to TokuNation for all Kamen Rider Zi-O Reveals. The massive mecha known as the Time Mazine is the last line of defense between the rebels of 2068 & the dark overlord Oma Zi-O. These mass produced defenders have even been known to be used by the Time Jackers… Sougo Tokiwa was given access to one thanks to Tsukuyomi travelling back in time from this bleak future. A means of travel to the eras of the legendary riders that preceded him, Sougo as the present day Kamen Rider Zi-O will gain the powers of the past to save (or dominate) the future! DX Time Mazine is the big DX toy of the line this year. In years past it was preceded by things like Captain Ghost, Tridoron, Suika Arms, and Wizardragon. While we don’t get to see a lot of the big items each year because of CG costs, Time Mazine is used fairly often actually. The DX toy winds up being one of the best articulated mecha we’ve gotten in a while (take that Sentai!) and is completely interactive with the Ride Watches of the toyline. This figure is also scaled to work with the Rider Kicks RKF line and even transforms to vehicle mode! We’ve attached the full gallery of DX Time Mazine to this article, but you can also read up on our full review of the figure by clicking “Discuss on the TokuNation Forums” at the bottom of this post. Later this week, we’ll be back with the legendary warrior, S.H. Figuarts Kamen Rider Cronus! Kamen Rider Zi-O Q2 Catalog Scans Released- Introducing Kamen Rider Woz! New images from the latest Kamen Rider Zi-O merchandise catalog have been posted online, revealing several details about the further adventures of this anniversary series! *Kamen Rider Zi-O upgrades to a new form- Kamen Rider Zi-O II! This new configuration splits Zi-O’s suit-literally doubling the watch decals on the chest and helmet. *Not to be outdone, Kamen Rider Geiz uses a new hourglass-based RideWatch to become Kamen Rider Geiz Revive! The Revive form has multiple configurations- closed armor for defensive combat and open armor for heavy attacks. But the biggest reveal in this new catalog is the THIRD Kamen Rider joining the adventure! This is our first look at Kamen Rider Woz! The green Rider from Year 2068 uses a new device known as the BeyonDriver along with his unique brand of RideWatchs- the MiraiWatch! While Zi-O & Geiz channel the powers of past Kamen Riders, Kamen Rider Woz is able to channel the powers of FUTURE Kamen Riders! Three brand-new Riders are shown in Woz’s arsenal- Kamen Rider Shinobi, Kamen Rider Quiz & Kamen Rider Kikai. 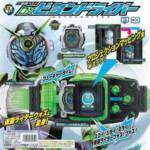 Using the MiraiWatches from each, Kamen Rider Woz can activate his Futuring Forms. Definitely some exciting times ahead for Kamen Rider! Stay tuned to TokuNation as we keep you up to date on all Zi-O reveals. All times are GMT -4. The time now is 9:50 AM.